Ever since he burst onto the scene at the age of 16 with Milan, where he gracefully pushed Diego Lopez out of his starting berth, Donnarumma has been consistent in his displays. Performing miraculous saves with each passing match day, all while remaining refreshingly calm and composed, "Gigio" has not only been compared to his namesake Gianluigi Buffon, but he has also built himself up to be Milan’s savior, a leader, and, unintentionally, a ‘bandiera’ of the club. Despite being born south of Italy in a town neighbouring Napoli, Castellammare di Stabia, the teenager, along with his older brother Antonio grew up supporting Milan. It was, therefore, a dream come true, when at the age of 14, he was scouted by Milan’s personal and was brought to Vismara (the club’s youth sector). Since being handed his Serie A debut by then Milan coach Sinisa Mihajlovic against Sassuolo, both he and the club have not looked back... So much so, he now finds himself facing some intimidating demands from Milan’s group of fans. Forgivably, one can understand the desperation that every Milanista holds inside them. It’s been nearly a year since reports of a new contract deal started circulating amongst the media, but his agent Mino Raiola refused to entertain the thought until he knew Milan’s takeover had been signed and sealed. Despite Silvio Berlusconi having sold off his shares back in April to Rossoneri Sport Investment Lux, Raiola is yet to sit down with Milan CEO Marco Fassone and Sporting Director Massimiliano Mirabelli to properly discuss a new deal. Leaving things justifiably tense in the Milan camp. Reports have suggested that Rossoneri’s new management have offered the 18-year-old a staggering €2.5 million a season deal, but Raiola will only be content when his client receives over 30 times more (€5 million) than what he is currently earning. Which player doesn’t want to earn millions, drive in fancy cars, play for the best teams in the world, and win trophies? Exactly! And, Raiola can give that to Donnarumma, on a silver platter too, by persuading him to move elsewhere – to a bigger and better club than what Milan are right now. On the other hand, the goalkeeper is still very young, and only recently finished his first full campaign in the top-flight. If he wanted to move, he still has plenty of time to do so later on in the future. Why now? Perhaps the most heart-breaking part for Milanisti around the globe is that, for Gigio, it should be a simple answer. If he loves the club, he should sign. 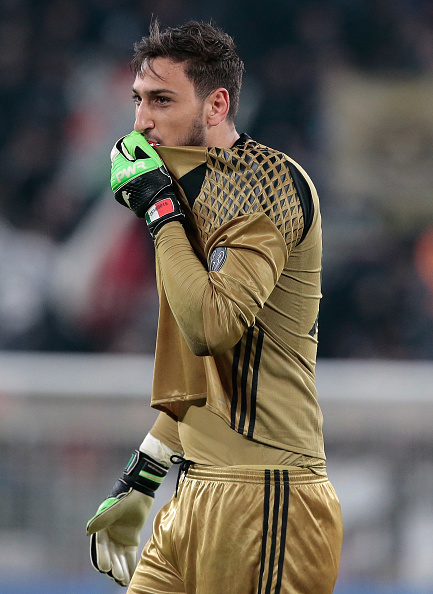 After Milan’s SuperCoppa success over Juventus in December, Donnarumma confirmed his affinity for the club by kissing the Milan badge and beating his hand to his chest all whilst pointing to the fans. It has somewhat become his weekly tribute to the Curva Sud, where his admirers can also be found returning the same gesture to him passion and meaning. Still, despite his displays of affection, little over 12 months remain on his contract, and Donnarumma has yet to address neither the fans nor the media about his status at the club, indicating he is perhaps seriously considering his options. Many would argue that throwing money in his path is the best solution in keeping Donnarumma at Milanello, but if that is the only reason he will remain at the club, surely it is better off cashing him in for a sum between €40 to €70 million before losing him as a free agent? Then there’s the question of the bandiera… Milan have gone so long without having a proper iconic leader and figure in the squad, one couldn’t blame the fans for believing that Donnarumma may be the next Diavolo to wave the red and black flag again. No longer, is Milan sitting in a state of uncertainty. In fact, if anything, they have proven to be one of the more ambitions team this transfer window, having already secured the signature of Mateo Musacchio, extended Vincenzo Montella’s contract at the club, and are on the verge of signing Frank Kessie from Atalanta. Therefore, Raiola’s trump card excuse is no longer valid. Sending Donnarumma abroad, particularly to England where the pound is good and the desire to splash millions is even greater, will always be in Raiola’s best interest. However, the final decision will always rest with the player. Firstly, Donnarumma needs to completely remove Raiola from his decision-making process. He then needs to decide if he wants to be a part of the new project at Milan, which could very well return to making history and be dominant once more, or move elsewhere for a quick fix solution of money, status, and silverware. Gigio, the ball is in your box… Be cool!